There is a current “pop-sensation” in the writings of a number of “atheists” whose pronouncements are always sure to garner media attention. Richard Dawkins, Christopher Hitchens, and others are current “go-to” sources for the media’s search for usable quotes from atheists. In many ways, the current popularity of such figures is fueled by “pop” Christianity. One mirrors the other. In matters of serious Christian thought – neither is of particular concern – neither has anything to say that should be of note. Indeed, it was noted consistently by the fathers of the Church that the existence of God was utterly beyond what we would mean by existence when we referred to anything in creation. Thus, if we say that we exist, we do not mean that God exists in the same manner. God’s existence is not like our existence – but utterly beyond – incomprehensibly beyond – anything we mean by existence. This important distinction is lost, of course, in modern conversations about the existence of God. In place of the reverential and careful statements of the fathers is the coarse pronouncements of modern atheists and their pop-culture counterparts. Of course, St. John of Damascus and all of the fathers affirmed the existence of God. But they carefully hedged the word “existence” about with qualifiers, that it might be clear that the existence of God is not to be compared to the existence of anything in the created universe. We know God, only because He has made Himself known. And though this knowledge, following the teaching of St. Paul (Romans 1:19-20), is recognized has having been “written” into the very heart of all created things, it is not the same thing as saying that the existence of God is “obvious” or that it should be compared to anything within the created order itself. Christians, therefore, do well to pay attention to this classical teaching of the faith. Arguments about the existence of God, often draw us into a level of speaking that forces us to say things that the faith does not say. It also tempts our hearts to think in a manner that is less true than what we have been given. The existence of God is a profound matter, and never something that should be treated perfunctorily. That “I believe God exists” and that “I know Him” are among the deepest things that a Christian can say, and are a confession of the grace of God. We have been given something that is consonant with purity of heart, and should thus confess it with extreme humility. More importantly, we should approach these profound mysteries with careful devotion and awe. That there are those in our modern world who spurn God’s existence as absurd is tragic. But it should not be a cause for us to treat them as though they were idiots. More foolish are those who too easily assert God’s existence without the proper awe and humility that such a statement properly requires. We are living in a time of history in which saints are required. We have long passed the time in which rational arguments will carry the day. Nothing less than lives which manifest the existence of God will do. The world has heard centuries of arguments – has been subjected to crass persecutions and atrocities in the name of God (even if these were largely not the result of Orthodox actions). We have survived a century of extremes (Bolshevism, Nazism, etc.). That the world is hungry is beyond doubt. But the world is not hungry for a new and winning argument. The world hungers for God (whether it knows this or not). The proper Christian answer to the hunger of the world is to be found only in the manifestation of God. Thus the challenge of a modern atheist should not be met with an anxious rejoinder from our panoply of arguments – but with the urgency of prayer that we might ourselves become an answer through the reality of the presence of God in our lives. In the course of my 56 years, I have occasionally encountered such living answers. To a large extent, I believe that I live and continue as a Christian as a result of the prayers of such persons. As witnesses of the God who exists – we should strive in our small ways – to become persons whose lives are themselves an argument for the existence of God – a God whose existence is indeed beyond all existence. It is a tall order. Nothing less than life in the image of the resurrection of Christ will do. Nothing less than that has been promised us in Christ. This entry was posted on January 21, 2010 at 3:12 pm and is filed under Orthodox Christianity. You can follow any responses to this entry through the RSS 2.0 feed. You can leave a response, or trackback from your own site. Thank you Fr. Stephen, I believe your finger is on the pulse, regarding the thoughts and questions that modern Christians (and non) struggle with today. Your writings put words to the anxieties that emerge from living in a world blinded by rational arguments and physical proofs, offering another way, a way of hope. Your thoughts here are a call to action. It is often discouraging that we have a lack of Saints in our world today but what you say here shows me that we all have the potential to become Saints through our lives and we need the courage to live what is written in our hearts. May the Lord give me strength to live what I say I believe. What you have written is very beautiful, but I have great difficulty reconciling it with Scriptural account, where God is significantly less mysterious and inaccessible. Where is THIS God? No silent awe or humility is needed to find Him. How does that contradict, “We know God, only because He has made Himself known”? What I said does not contradict that proposition. Very interesting. Care to offer up any candedates? I myself am pretty confident in my athiesm, but I’m not closed to the posibility of the existence of a god, gods or any other supernatural manifestation. If it is your contention, and the contention of those that agree with you, that exceptionally saintly and moral people can somehow prove the existence (in a non-quantifiable way, which seems to be the criteria) of god, I’d be pefectly willing to consider examples of people who, in your opinion, measure up. Indeed what you have said does not contradict that – God does and has made Himself known – though you cite very specific revelations. There is, as well, St. Paul’s more general revelation referenced in Romans 1, but our hearts our not pure, so we do not know Him in that either. But the Christian who does not recognize the true nature of the God Whom we know, and the silent awe and humility required to find Him, will all too easily substitute a rational cypher (such as a patch-work rational treatment of Scripture) rather than true knowledge and participation (communion) with the God Who is. Scripture does not, of course, contradict this revelation, but a revelation arrived at through reason (or reading) alone, is not the same thing as actually knowing God, even for a Christian (Job 42:1-3). Through the gift of Jesus Christ the true God has made Himself known, and He may be known in no other manner. However, that is still a manner of awe and humility. Otherwise we join the crowd of Christian noise-makers who will have no effect on the deep hunger of the world. There are such people. But there’s much conversation to be had (it would seem) before we could discuss that in a fruitful manner. But putting forward such people is not a rational argument, though a living proof. There will be no “rational” arguments for what transcends the rational. I would contend that much of what many moderns describe as “rational” is a sort of caricature of the word. I also would put forward no “supernatural” manifestations. That category itself is a poorly defined product of “modern” rationalism. I find it unhelpful and misleading. I could cite a long list of saints, both ancient and modern, who would serve as candidates as witnesses to God. But a life is not a biography, and talk about a life is even less than a biography. But I have met such. It is a good thing to not be closed to the possibility of the existence of a god. What I have suggsted in this article is that the possibility to which one should be open transcends many of the typical categories (including existence) as understood in most common conversations on the topic. “That there are those in our modern world who spurn God’s existence as absurd is tragic. But it should not be a cause for us to treat them as though they were idiots. More foolish are those who too easily assert God’s existence without the proper awe and humility that such a statement properly requires. Dear Father, bless! Another good post! The above quote especially resonates with me. That I could make such a post with tears of pleading! “The Light shines in the darkness and the darkness has not overcome it,” remains true today. But the Light primarily shines in the daily lives of believers. That the world around us often does not believe is not condemnation on the world, but on our failure to properly manifest the Light. There are many good hearts among those who do not believe – sometimes they are hearts whose purity should make us tremble. It is not their judgment that concerns me. “Judgment begins in the household of God,” and with the miserable soul of this sinful priest. Perhaps one of the most profound mysteries of God is, first off, His eternity and, second off, His love. Man cannot comprehend either, though we revelations of both in God’s written Word and God’s incarnate Word. His eternity is such a mystery to us because we cannot comprehend life without ceasing; to live forever we know only as an immortal life that was once began in the womb, but to live forever without ever being born is something we cannot comprehend. We must even use time – that which limits us – to understand God, and so our understanding is even less, for we ask, “How long ago was God?” and reply, “Trillions of years before the Big Bang,” and again ask, “But isn’t He the Ancient One?” and again reply, “I can’t count to infinity!” Yet such counting, so to speak, is necessary to understand God’s eternity – but as we can’t count there, neither can we fully comprehend God’s eternity. Another mystery directly related to God’s eternity is God’s will: When did God ever start to think of us? The philosopher cleverly replies, “Never!” – for there was never a “when” before time – and the common man asks, “So than God was always thinking of us?” and that is when the philosopher folds his cards, for he can neither give a Yes or No to man’s question. It is a mystery too great to know! His love is such a mystery to us because we cannot comprehend true love. We say, “He made us so we might share in His life!” but do not realize those words’ meaning; we know them, but do not realize them. But God, again in His love, knew this, and sent His Son to teach us – among other things – about His love: By His Death He has shown us God, who is Love, for there is no greater love than that of the Lord. It’s truly wonderful, too: God loved us so much that He spared nothing to redeem us, and what have we done to show our gratitude? Nothing! It is this realization of our nothingness that makes us ponder God’s love. Why would He create us? Why dose He love us? Some even venture to ponder, Is God truly love? Dose God exist? The mystery is great – too great to comprehend, yet, here we exist, here we are pondering upon our Father. He has created us for Himself, He who is Joy beyond all joy, and so we are created for Joy: and since we desire happiness, so we are created for our own sake – and again we fly back to God, the Joy that alone can satisfy our hearts, and we marvel at His sheer Goodness in creating us! And once more we ponder upon His love! As often as we ponder, so as often do we swoon in love, yet will never fully comprehend His love: It is too great for anything to comprehend. Religion is a different kind of human practice than science, mathematics, or even art. I could no more explain why the mona lisa is significant with a mathematical equation. It’s not a proof, but a perspective that once given room, illuminates life in a manner that is impossible otherwise. Thank you for these reflections Father. It is enough to have a “beautiful corner” somewhere, which by definition is also the secret always kept. I would find this an inadequate explanation of knowledge – “comparing two things” – God cannot be compared, not even to the idea of God. There are possibilities and models of knowledge that you have excluded – models which are quite important. I “know” how to ride a bicycle, but such knowledge fits nowhere in what you have suggested (to use a perfectly mundane example). God is not an idea. And no idea that I may have of God is adequate. The fathers teach that God is “incomprehensible.” What model of “incomprehensible” is possible? It is important that we know the true God, and not simply have an idea of God, nor even simply think that our idea is “true.” Again, God is not an idea, nor is He like an idea. That the Christian God is “difficult to understand” or “incapable of being fully known” I could readily accept. However, I cannot see how the truly incomprehensible and indescribable could be a potential object of knowledge, true belief, and especially shared experience. If something is truly incomprehensible, how can people be led into it? If I want to know the truly incomprehensible and indescribable, and I follow a method or a system of doctrines and practices to obtain that result, then verification of the method’s validity to any extant is *definitionally* impossible. Indeed, only mathematics speaks in univocal language and jokes are made in equivocal language! I’ve been struggling with how exactly to think of this apophatic type of theology. It often seems to me to be taken too far. For example, you say: “God’s existence is not like our existence – but utterly beyond – incomprehensibly beyond – anything we mean by existence.” But if there is nothing similar between what we mean when we say “I exist” vs saying “God exists,” then the sentence “God exists” doesn’t even seem to make sense. Apply this to another type of situation. I’m a Christian in part because I believe strongly in love and in beauty, and it seems to me that the Christian God is a God of love and beauty. But if God’s love is nothing like our love, and God’s beauty is nothing like the beauty I see around me, then I lose my grip on what it is I believe in and why. Obviously, we can’t understand God’s essence, and obviously his love and beauty is something compared to which ours is just a shadow. But it seems we must insist that his love and beauty are not incomprehensible, but only not FULLY comprehensible; but that we do comprehend in part because there is such a thing for us as genuine love and beauty. Can you give me some thoughts on this, or point the way to something you might be helpful? We can’t know the truly incomprehensible God with our human intellect. He is God. But, He condescends to us and lovingly reveals Himself in a way we can understand in the Scriptures and the teaching of the Church. But there’s more: intellectual knowing is not the only kind of knowing. We can know God also with our senses through the Eucharist and other mysteries. This too is a loving condescension and true knowledge. God’s energies can lovingly penetrate our hearts, or so I have read! PS – Fr. Stephen; I am not Orthodox but am learning the ways of Orthodoxy. My thoughts above are really an attempt to come to terms with Orthodox understandings. How am I doing? Of course. However, incomprehensible and indescribable, are specific terms applied to God by the fathers of the Church. But to what category of experience does God belong, or to what group can He be compared. If anything, I have pointed out the incomparable God (in Whom you believe) and have only pointed out that He is incomparable. If He is incomparable then He is, of course, sui generis. And we speak of Him with awe. Of course He is definitionally impossible. Forgive me, but this is theology 101, which many Christians have failed to consider. There can be no “method” to the knowledge of God. If this establishes a conundrum, well and good. Read St. Gregory the Theologian, or many of the early Fathers of the Church. They wrestled with this, and from this comes the foundational teaching of the Christian faith. Without this, we subject the knowledge of God to the most rudimentary ridicule by the philosophers of this world. It is important. Here we enter upon the proper realm of Christian faith and thought. The Christian claim is to know the incomprehensible God (thus we speak in such hushed and careful terms). If we speak of a God who is not incomprehensible, we speak of less than God. Of course, this is the mystery. That the incomprehensible God has made Himself known in Christ. Thus we start at Christ and not at philosophy. All thought about God and knowledge of God begins in Christ and in His Pascha. Things such as beauty and love that we know (in this world) are indeed but shadows of His beauty and love, but because we know Christ we can say that this beauty and love is but shadow. Christ has affirmed the truth of this beauty and love (even though we know it in shadow). All of this continuously draws us toward Christ, who is the only revelation of the Father, without Whom we would not know God. It also draws us properly into humility and awe, without which our knowledge would quickly become delusion. And so the Tradition tells us, “He who prays is a theologian, and a theologian is one who prays.” A philosopher is not a theologian. God is not FULLY comprehensible – but we can know Him and truly know Him (knowledge as participation) in Christ Jesus. Such knowledge is not comprehension. But comprehension is not saving knowledge. We do not want mastery (comprehension) but participation (saving knowledge). You’re doing well. I would put even more emphasis on the knowledge we have in our hearts (which means we need to learn to know how to know our heart). I had one other thought about one of your earlier posts. Our first perception of anything must be accompanied by a revelation by either another person or God. For instance, the first time I see a flower I need my mother to say, “This is a flower.” When I first encounter God He has to reveal Himself to Me. He did this to Moses in the burning bush, for example. My ideas are not nominally connected with only myself. Another way of saying this is that all our human knowledge is communal – we can’t learn anything alone. Nothing. So, in my understanding, that is why love is at the center of all knowing because knowledge is always transmitted via relationship. The Trinity is the source of these things, in a manner of speaking. It has been very good to interact with you on these thoughts. One of the great gifts of the Orthodox Church is the sense of mystery, reverence, and awe its tradition emphasizes. Father Stephen has communicated that sense with respect to the existence of God well in this post. There can be, however, too great an emphasis placed on the mystery of God’s existence so that the role of reason in defending the Faith is denied or, at least, too greatly diminished. Consequently, there remains no or little rational defense against supposedly rational attacks. This approach is a disservice to the Faith, which is the truest of things, and, as we see from Scott’s reaction, highly ineffective. God’s existence is, no doubt, of a different kind from any creature’s. One cannot, therefore, speak of God’s existence and our own in a univocal manner. There are, however, distant similarities; and one can, therefore, use the tool of analogy to express those few truths known about His existence. These truths are important; and we must communicate them in order to “give a reason for the hope that is in us.” Doing so does not prevent us from acknowledging that there is much that we do not know about God, i.e., that there is much mystery. The fact of the matter is that we can know, at the very least, that God exists given the continuing existence of the universe. ‘The world and man,” as the Catechism of the Catholic Church puts it, “attest that they contain within themselves neither their first principle [i.e., their cause of existence] nor their final end, but rather they participate in Being itself, which alone is without origin [ontological, not temporal] or end” (Paragraph 34) We can, therefore, through a careful and correct examination of ourselves and the world around us, conclude that “there exists a reality that is the first cause and final end of all things, a reality ‘that everyone calls “God”’” (idem). We should help men of good will (i.e., those who are open to the evidence) to make this kind of examination through reason strengthened by revelation. Thank you for posting Holy Rus again, Father Stephen — it’s really starting to grow on me. Precisely, any potential object of (individual or communal) perception, memory, and subsequently knowledge is by definition not incomprehensible/unknowable. But God is not “like” any other thing. In God, we incomprehensibly know the incomprehensible. Of course, this is a great mystery. But to ponder this as something less is to have reduced God to something less. Orthodoxy traditionally makes less use of the analogia entis than Catholic thought. That it is a slow start for Scott is not a problem, simply an illustration that apophatic thought is too little taught. I have only scratched the surface here. That it raises problems is not the fault of apophaticism, but of much modern Christian teaching that is a stranger to the apophaticism that is utterly foundational in the patristic teaching of the Christian faith. 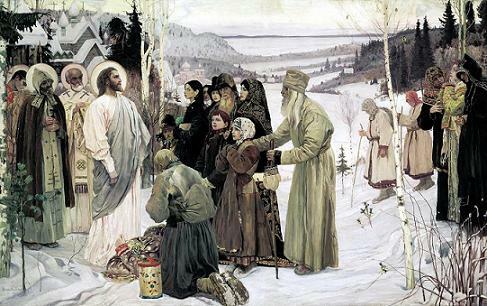 I like the painting of “Holy Rus.” In an artistic form, it points to the living experience of Christ in the life of a people (from every walk of life in the painting). Your’s is a balanced argument yet man lives in an increasingly risk averse world which rejects and belittles anything it does not understand, which is much indeed. Modernity prefers solutions that are scalable, convenient and preferably fashionable. The truth is, we do not have anything like an adequate response to the incomprehensible glory of God — but respond we must. It is incredibly humbling, but also shocking, to see just how far off the mark we have been. Yes Father, it has almost iconic qualities. I really enjoyed your article. You have certainly shed light on the “frightening” subject of the existence of God in a way I had not thought of before. What you say here makes a lot sense. It is what St. Francis of Assisi said about always preaching the Gospel and when necessary used words. It is true that all the logical arguments one can come up with will not enlighten someone who does not yet believe unless your life is lived according to the Gospel and that you have a personal relationship of spending time and prayer with God, the Creator, the Lover of our souls. When trying to explain to an atheist, an agnostic, or a deist, etc who God is we are really trying to give God to that individual and we cannot give what we do not possess. The Christian faith is supposed to attract others to God by the love that we have for God and one another. As Scripture says, if we have not love, we have nothing. 1. Re-read Fr. Stephens article above a few more times with each re-read looking for something that you may have overlooked previously. 2. God is a Person. God is Sovereign. You cannot run an experiment to test for His existence or non-existence. He won’t let you do that. All science can do is exhaust all other possible explanations and come to the conclusion that there must be some Being outside of creation that does not depend on anything or anyone else for Its existence, as many scientists are doing now. This does not require that this Being be the God of Judeo-Christianity; you only realize that creation didn’t happen by itself; therefore, Someone had to have made it. 3. The main point I want to give you is that those who believe in God do not do so by the powers of their own intellect, or their mind, or their heart, or their emotions, or theirs reasonings, or their ego, etc. Belief in God is a gift from God. Faith is a gift from God to the believer. We believe because God first loved us and chose to reveal Himself to us and invited us to come in to His and He requested of us to let Him into our lives. Just having knowledge about God does not please Him for Jesus said even the demons believe and tremble. What pleases God is that we love Him back as He has already loved us and in so doing we love our fellow man with the love God has for us. 4. I should clarify what I meant when I said that God is a Person. In fact, God is three Persons: God the Father, God the Son (Jesus), and God the Holy Spirit. Everything I said in point 3 above is brought about by the indwelling of the Holy Spirit. This is why those have taken up the position of unbelief, i.e. atheism can not comprehend the believe in God of Jews and Christians. When Fr. Stephen said that when I say that I exist versus God exists we are not speaking of existence in the same way. Attempting to comprehend the existence of God is actually pretty scary; we find that it is completely outside of our realm of existence to grasp the existence of He who always was, is, and always will be. In the same manner when believers say I believe it is not that same word when some says I believe it will rain tomorrow or I believe that one is the better choice, etc. When we say I believe we are referring to the gift of faith that God has given to us, a gift He gives freely to all who want it. So I have a question I would like to ask you with all Christian love and kindness: If there is no God, no Supreme Being Who depends on no one else or anything else for His existence then why does existence exist? In other words, if there is no Creator then why does creation exist? I invite you spend a little time meditating on this; don’t try to answer right away. In my opinion this question is more frightening than trying to comprehend the existence of God for the believer. 5. One last thing: if you really want to find out if God exists, if you are at that point in your life and ready to be responsible for this “knowing” then I invite you to take a chance, a leap of faith, and talk to God and ask Him that “If you are real then show yourself to me so that I know that you are there.” You your own words; God loves to hear from us in our own words. And again, if you are ready invite Him into your life. Now when you do this and you come to believe you will need to find a faith community to fellowship with. I believe Fr. Stephen is Orthodox as he used that word in him article and I am Catholic. Hint, hint… I am givig you a clue as to where to look for a faith community. Forgive my computer for the typos it made in my comments. My “slow start”, is slower than you think! I’m afraid you gentlemen have left me in the dust. I’m too little versed in apophatic thought (and many other things, I’m sure) to even begin to understand either of your comments about what I had said. I’m not even sure where we agree or disagree; but the burden is all mine as I’m so new to these things. I first heard this thought in a podcast by Fr. Thomas Hopko. In it he made reference to the fact that God not only cannot be known by us, God also does not have existence as we understand existence. This statement was so obviously true as to need little justification. But, at the same time it was a truth that is so obviously obscured from us by our notions of existence. The more I thought about this truth what became apparent to me was that God has no existence, but God does have presence. And, that presence is more powerful and real than any existence we have heretofore experienced. In this way God neither exists but (get ready for the double negative), nor does he not exist. God’s presence transcends and overpowers even the very question or meaning of existence. I do not know what the implications of this truth are. In fact it makes my mind dizzy just thinking about it. Everything I know has existence. I only relate to things that exist. I do not relate to things that do not exist. But, paradoxically, when I free myself from thinking about God as a being that exists, or does not exist, my mind at last is set free to begin to comprehend God as he is, not as I imagine him to be. In that way, perhaps relationship with God is something completely other than what we understand relationship to be. I only relate to things that exist. To have existence something must have once not been, but now be. And of course, a condition of existence is that eventually it will not be again. But, God, the creator of all that exists, does not exist (Not as we understand existence). So having relationship with God must be something completey different than my relationship to those people and things that have existence. But, since the “I am” is in fact “presence”, that presence falls outside of existence, time, space and all that we experience, know and understand. This knowledge brings with it the comfort that the God that has no existence remains present with us at all times and will bring us unto himself even when this life passes once again into that place of non-existence. It is this presence, the presence that transcends existence, which brings the peace that passes all understanding. I faced the same delusion regarding a pony I thought our family owned when I was a child. Those who knew Christ “according to the flesh” as St. Paul puts it, still did not rightly know Him. He comes to be known by them in the mysterious encounters after the resurrection. Prior to the resurrection there are only occasional glimpses (such as St. Peter’s confession, which Christ notes “was revealed to you by my Father in heaven”). It is for this that St. Peter is blessed. And our knowledge of Christ must be like that of St. Peter – not derived from St. Peter’s statement – but precisely in the same manner as St. Peter’s statement. “No one can say ‘Jesus is Lord’ except by the Holy Spirit” we are told. But all of this is apophatic theology. Apophaticism, as taught in the fathers, and, indeed, stated quite clearly in the liturgy of St. John Chrysostom, raises clear difficulties for our reasoning faculties. To say that “God is incomprehensible” and then to continue speaking about God is somewhat self-contradictory – a paradox. But the faith, particularly as articulated within Orthodoxy, is very much a paradox. Apophaticism (knowing something by not knowing it) is not a sub-category of Christian theology – it is where theology begins. The major point of this post (which is clearly addressed to believers and not to non-believers) is to urge Christians to embrace the faith in its fullness – in the fullness as taught by the fathers and not in the truncated and mis-stated ways that modern Christian parlance has offered to us. Apophaticism (knowing the Unknowable and knowing Him as unknowable) is the beginning of all true theology and is a place to which we must come if we actually want to know God (and not just bandy about ideas and discussions about ideas). God is not an idea. Just some thoughts for the purpose of clarification. The points of this post, it seems to me, are among the most important things I have offered in a while. I plan to stay with this post and related posts for a few days (begging your patience). I thank you for your helpful comments. As I said, this is still something new to me. I’m still not convinced one hundred percent of everything, though. Especially your comment that apophaticism is where theology begins. Though there are apophatic statements in Paul, for example, the most important things always seem positive. God so loved the world…In the beginning was the Word…Christ has died, Christ has risen, Christ will come again. Christ was delivered up for our sins and repentance will lead to oneness with God. These are the center of the Christian faith and they are all positive. Granted, they are all revealed truths, not things that could be deduced by reason, but they are positive facts. Why should not theology begin, as I have always envisioned it, as starting with these – looking carefully at the things God has revealed about himself, through Christ, and see how they fit together and relate to our everyday experience of the world. All the while, of course, being aware that there are deep mysteries and maintaining a reverential humility. Father can you help me? You said above, “All of this continuously draws us toward Christ, who is the only revelation of the Father, without Whom we would not know God.” What do the Father’s of the Church teach about the revelation of God in the lives of the saints of the Old Testament? Jesus, the second person of the trinity, who is of one essence with the Father, who always has been one with the Father, is He the one who King David knew? Does the Church teach that Jesus was the person of the Trinty who was known in the hearts and lives of the Old Testament saints? I know in my heart that God is known. In my sin I am certain that God did not abandon me. I abandoned him. He was the one who inspired me, when in the grave of dispondency, who said clearly to my heart, “Pray”. He has said that over and over again throughout the years and only now did I really listen. While in that deep dark hole God was, I believe, with me. God brought me to the place where I was introduced to The Prayer. As I said, “Lord Jesus Christ, son of God, have mercy on me a sinner”, over and over my heart was stilled and I arose from the grave. I could see and experience myself crawling out of that deep dark hole. I know God who I only glimpse now and again in prayer, stayed with me and set me on the road to Orthodoxy. I was on this road years ago I just did not realize it. Two and a half years later I was baptized and Chrismated. My prayers and life faulter but I hope and pray that as I strive to confess my sin, pray and study the scriptures in the light of the tradition and teachings of the Father’s and the Church I will come to not only know God more fully but be transformed little by little into his likeness. I am not sure if this is at all helpful in the discussion that is above. It appears to me that the problem with our thoughts, our talk is that we can only talk about God or the experience. That is not the same as knowing God, which as a rational Protestant (my old man), a tendency I still fight, leads us not to God but rather to thoughts about God, or thoughts about how God is known or not known. I agree that these statements and realities are where we begin. Christ is risen is the most central of all. But coming to know it – truly know it – is an “apophatic” encounter – an encounter of true knowledge that is perceived in a manner that transcends our ability to completely explain. In this sense, apophaticism is the beginning of theology. It is the humility of our hearts before the wonder of the living God who has made Himself known to us. What you describe sounds similar to what I am saying. Yes, the teaching of the Church is that God, as He makes Himself known in the Old Testament, is the second person of the Trinity. “No one comes unto the Father except by me,” Christ says. If you notice in icons of Christ, one of the titles is O WN (forgive my lack of Greek fonts). It is from the phrase: “Ego eimi ho on,” “I am that I am,” the name by which God revealed Himself to Moses. It is inscribed on icons of Christ, clearly making the identification with God as He makes Himself known in the Old Testament. There are good articles on this – I recall some particular ones in Leonid Ouspensky’s works on the theology of icons. Your personal account is very moving. I know the darkness of the grave as well from an earlier time in my life, and the mercy of God who spoke to me in that dark place. He truly is the Light who enlightens every man who comes into the world. I give thanks for His mercy in sparing me and preserving me to this day. May He have mercy on all of us who find ourselves in darkness. “Εγω ειμι ο ων”, “i am he who is” (or “I am the I am”), in other words, pure being itself. It is one of the most beautiful revelations of God in any tradition in my opinion; once, 20th century Zen master, calligrapher, swordsman and abbot Omori Shogen, was read this account and he said that he was “very impressed” and that it was “pure Zen”. Being reminded of this in all orthodox icons of Christ, and the reckognition of this significant revelation as the essential characteristic of God is one of the most insightful and significant things in Orthodoxy, for me. I think that it is indicative towards which direction one who wants to know God experientially, in the here and now, should move towards to; not to any idea, or perception or memory or teaching, but towards pure being it self. In the now iconic Zen gardens, the rocks placed inside are positioned in such a fashion that they “cannot be all seen at the same time from whichever side of the garden one stands”. This was purposely made so, and it contains a spiritual insight: that no point of view will lead to spiritual truth. A point of view assumes that there is a seer and a seen – subject and object. But spiritual truth is not about viewing things from a certain angle but about integrating with them – making the subject and object one. Only when the rocks are not viewed from any place partiality is lifted, one needs not see, but be. The Prayer of the Heart coupled with conscious self-detaching discipline (the greek/orthodox translation of the word detach is apotagi – αποταγη – and is frequently used by the Fathers of the Church, past and present, from The Philokalia to Fr J. Chryssavgis) can lead one (assymptotically perhaps but nontheless) to being being itself (repeated words intended). In a state of pure being, there are no ego desires, fears and hopes, and so no passions – the state of απαθεια(apatheia). When there is no self will left, ie one’s will has merged with what the Fathers call “The will of God”, love can be unconditional and for the sake of itself, an act gratuit that starts from itself, feeds of itself, and ends in itself. I understand your points, though I cannot draw the parallels with Zen. I would be hesitant to translate “Εγω ειμι ο ων”, as “I am pure being,” for a variety of reasons. For one, I would find it a poor translation of the Hebrew original. For another, “pure being” can easily mean something that is less than transcendent. God exists, He has being [utterly transcendent being]- but He makes Himself known as person (rather than as ousia, being or essence). In Orthodox understanding, I cannot know God in a manner that is not personal (a sort of ‘God behind God’). Forgive me if I seem to quibble, but it is important. It is Christ, after all, whom we see in the icon, bearing the title, ο ων. It is the unique teaching of the faith that “ο ων” is none other than the incarnate Christ God. You don’t seem to quibble F. Stephen and forgive me if i quibble. I think “hesitate” is the key word of yours here. You hesitate because you (naturally and correctly) wish to remain firmly within the orthodox framework of terminology and are afraid that words outside of it may be misleading. I dont blame you, neither misunderstand you for it, but if you see the essence behind my words you may understand that we agree in far, far, far more than we disagree, and where we disagree is in a realm that goes beyond words – a realm that theology (as a subject of study and map of faith) has little relevance. It is the realm wherefrom theology comes from and it does not have to comply with its technicalities no matter how shocking to professional theologians. With you being a (good) scholar and an (honest) priest, it is of little surprise for your objections. You are right in as much Orthodoxy and Christianity in general maintains the personhood (υποστασις) of God, while Zen and other eastern traditions speak of an impersonal Absolute – but then again this personhood must be beyond personhood in a way, else it wouldn’t be “the eternal Logos by which all things were made”. If Christ has a name it should be no-name, if God has a form it should be no-form – else its transcendence has become concrete, its eternity finite and its salvific power limited in the (particular) person of Christ God. PS Pure being is my interpretation and not my translation – my translation was ““i am he who is” (or “I am the I am”)”, which i believe are linguistically closer to the greek text (i have admittedly no idea about the Hebrew) than “I am that i am”. The “name of Jesus is certainly the name above all names,” but He is never the “nameless one.” This is the mystery of Christ and why Orthodoxy is not simply Eastern mysticism. But you understand this in me. Orthodoxy is not simply eastern mysticism, neither eastern mysticism is simply Orthodoxy. Perhaps I should have used “indescribable” rather than incomprehensible, when speaking of the glory of the Risen One — blessed be His most Holy Name — for He can be, and most certainly must be, understood. Understanding is a prerequisite for salvation. As for Father God, well, to see Him as He is, is to turn to stone. And yet, before Him all inanimate objects must themselves be brought to life — for His truly, is the only existence. This is, admittedly, a little harder to understand. May the Holy Spirit, gracious and forgiving always, be outpoured without limit onto the generations to come. 1. About “No one comes to the Father but by Me”–someone wise once pointed out to me that usually, we interpret that verse as if Jesus is the quintisential Celestial Bouncer, standing at the door in order to keep people out of the party if they don’t have the requisite credentials. But another way to look at it might be that if you find yourself to be aware of experiencing any kind of connection/relation with the Father, it is because you have been brought into it through the Son. What do you think about this? Has anyone in this blog community read his book INTO THE SILENT LAND, and if so, what do you think of it? I don’t know who Martin Laird is, neither have read any of his books, but this quote is on the point, as far as i am concerned. The living Church stands or falls on the resurrection of the Son of God, or the testimony pertaining to the fact — not on claims of who or where the Messiah might be. Jesus warned against this, specifically. This, rightly understood, is the distinction between apophaticism and rationalism; between orthodoxy and modernism. Consider: How many claims have been made regarding the messiah or the one true church? Consider: No one can claim to be the Risen One except the risen one Himself. Consider: Theology 101 is a lousy excuse for Christianity. In fact, it’s not Christianity at all, and it points to “the God that does exist” — the Devil. I was addressing “anonymity”, more than anyone in particular. Thank you for your reply. Pointing out the title , ““Ego eimi ho on,” “I am that I am,” on icons of Christ is appreciated. I recall those same words, “Ego eimi” in the I am statements in the Gospel of St. John. Your comment helps tie things together for me. “Theology 101” is certainly not a lived Christian Faith; nor does any one, as far as I am aware, equate the two. Indeed, no theology is a religion. Theology is the study of the nature of God, to the extent that this nature can be known through the other sciences (e.g., metaphysics) and revelation. Religion is a relationship with God consisting, most visibly, in public worship ( with respect to the human side). Theology is, nonetheless, helpful to religion; for our relationship with God, like our relationship with any one else, is based upon our knowledge of the other person and what that person has done for us (hence catechesis). This foundational knowledge is, among other kinds of knowledge, theological. Some of those saints who had apparently the closest, most mystical relationships with God were Doctors of the Church. P.S. : I was not referring to you, Scott Weatherhogge, when I referred to “Scott’s reaction” in my first post in this thread. I referring to the Scott of yesterday’s post of 5:54 p.m. Thanks for your enlightening answer Micah. A more complete exposition of Ps. 68:36* would include both “sanctified space” (mikdashekha) and “sanctified person” (mekudeshekha). Great post. I spent several decades of my life fairly comfortable with my atheism – a great irony is that it was Dawkins and Hitchens who forced me to start to re-consider things. My final turn toward Christianity was initiated by the realization that it simply provided a better and I believe correct answer to the question of what it means to be a human being. I thought I might recommend St. Gregory of Nyssa on this topic, specifically on the “infinity of God” and our capacity to move ever closer to, but never grasping, the Divine. DB Hart’s Beauty of the Infinite is a good modern philosophical text (if you’re in to continental philosophy) that utilizes St. Gregory’s ideas. I know GOD knows me! Ken, that is surely the place to start (and perhaps where we ultimately end as well)! A profound statement. Dear Father, bless! In rereading your post and a few of the comments, I was reminded of a true account I heard as an evangelical. A Christian teen invited a non-Christian friend to a Bible camp, hoping to introduce him to Christian faith. The friend attended, but much to the consternation of the Christian teens and leaders, a Jehovah’s Witness teen was also attending and had many and persuasive arguments for his own religion’s take on the Scriptures. The unbelieving teen had many questions for those committed to religious faith, and the Christian teens were dismayed because their skill in argumentation for their own faith was continually bested by the JW teen. They thought surely if the skeptic would come to faith at all, he would embrace JW faith before that of the Christians there present. At the end of camp was a call to embrace Christian faith. To their surprise the formerly skeptical teen went forward to accept Christ as the Christians proclaimed Him. When asked why he chose this way, he responded that it was true the the JW had more persuasive arguments, but he was convinced of the truth of orthodox Christian faith by the love that the Christians showed for him and for one another. This he found more persuasive than any argument. anonymous, I have not read it. Even better than that, keep one’s eyes always in one’s own head — not in one’s neighbour’s. That’s pretty standard fare in Holy Orthodoxy, isn’t it? When I speak of theology, an in “Orthodox theology,” on this blog site, I generally do not mean what you learn in a classroom. The classical definition within Orthodoxy, is that theology is the study of God (not particularly academic at all). The Orthodox proverb says, “He who prays is a theologian, and a theologian is one who prays.” This is its ancient, and proper meaning. Too often distorted in the modern world. Quite right Father. I’m glad I have stuck with Orthodoxy. It is the fullest expression of the Life of the Son, this side of the Eschaton. re: *Into the Silent Land*, I read it recently and liked it very much. I can’t remember too much in the way of specifics right now and it was a library copy, but recollect that I found in it some very helpful thoughts about the nature of contemplative prayer. Forgive me, but what about Faith? Prudence, if you are addressing Ken’s brief comment, I think the truth St. Ignatius has expressed is implicit in the kind of “knowing” Ken’s brief affirmation presupposes. That’s my take, anyway. Good quote, BTW! Last night at a bible study, I heard a new one….a religious atheist…you know, one of those intellectual types that do not believe in God but prides in his intellectual musings. Gregory, would you mind if I asked you what it was that helped you turn to Christianity? If I may add a brief suggestion, having read this post and pretty well all the comments(!) – Fr Thomas Hopko has a powerful podcast titled I AM, in his Series on the Names of Jesus (Ancient Faith Radio). The whole series, in fact all his podcasts, are extremely illuminating (and sometimes challenging), this is my all time favourite so far. Faith, like spiritual knowledge, is not an intellectual thing (in which case faith would be exercising a sort of “philosophical trust” or something similar). Faith is an organ of perceiving, a means of knowing the truth. None of what I have said is contrary to faith, but is at the heart of faith. Thank you so much for this post, I enjoyed it very much and read most of the comments, and I am waiting for those posts you mentioned here patiently. It is always to me that we have to be humble and handle our Faith in absolute quiet manner. Smeone in your previos post said… Orthodox Christians have a long tradition as a quiet, reverent Faith. It is like you said ..we need to recognize the true nature of the God Whom we know, and the silent awe and humility required to find Him ..God has made Himself known, and He may be known in no other manner. However, that is still a manner of awe and humility. Otherwise we join the crowd of Christian noise-makers who will have no effect on the deep …. Knowing God may rest in an ability to perceive God, but I believe a critical component is Trust in God. Over-intellectualizing the process, it seems to me, just short-circuits Faith. Greg, I second frontierorthodoxy’s question–can you tell us how you moved to faith from the position of Dawkins, et al? It’s not a merely academic question for me–there are people in my life who are very much in the Dawkins camp, and I would love to have even a shimmering of a kind of bridge for conversation…But you may not want to share your story, which is fine, of course! You said that you can’t know god in the way that you know your wife. And of course, this is true. But from my own marital experiences, it seems that there is some glimmer of this incomprehensibleness in even our most intimate relationships. When we got married, nearly ten years ago now, I thought I knew my wife pretty well. But now, it seems that the more I know, the more I realize how much there is I don’t know about her. I am ever being surprised by her. Sometimes, she surprises me in ways that amaze me — I chalk this up to my previous sins that I didn’t realize it before. Sometime, she surprises me in ways I don’t like — I chalk this up to my current sins. But regardless, it seems part of our sinful state that we can’t know people as they truly are, even those persons that are closest to us. You can tell me if I am trivializing this, but it seems to me that all of our relationships contain an icon of our relationship to God and our ability to know Him, and our ability to not know Him. So surely, I don’t know God like I know my wife, but neither do I truly know my wife, the person with whom I am most intimate. There remains something incomprehensible even about my wife. How much more do I not know God! The paradox of knowableness and unknowableness seems self-evident to me–just by comparison with these relationships God has given me out of his mercy. I grew up in a town where science and atheism flourished. I find myself again surrounded by atheists. I'd much rather be in the company of an atheist than a bible-beating "christian." But I do not know how to be in this relationship humbly when in discussion with them. I know at times there mission maybe only to see if they can sway me, but overall, I know the majority of my atheists (in real life) would want no harm to come to me at all. I have no fear of being swayed and know it is by nothing less than the Grace of God that I have "known" Him. But I have a fear of being anything less than an answer to them. How far to I go in discussions with them? To sum up. Of course the Devil does exist, but his is a limited existence, unlike the existence of God. Fr. Thomas Hopko gives an interesting account (on Ancient Faith radio) of how the new and still evolving modes of thought in the social and physical sciences have wreaked havoc in the Church, in recent times. This only response to this is prayer or communing with God in the unapproachable light of Christ. Unapproachable of course, as far as the demons are concerned. Our fallenness makes prayer harder than it should be. And yet, the simplest of souls pray continually to great effect and with the utmost of ease. Those who fled Egypt with Moses ate manna from God, drank from a well provided for them by God, witnessed the Passover, and witnessed the destruction of Pharaoh’s army. They had concrete evidence that God existed; it was there to see. And how does this story continue? They made and worshiped idols because it isn’t that easy to believe that God exists. And look at how the apostles were during the crucifixion. And they lived with Jesus himself. I think believing is not an easy thing; especially since we all have sin. Perhaps looking at and loving atheists will allow us to see our sins and find communion. We don’t have to fear anymore. I think that in “the Orthodox Way” Met. Kallistos expands on this while linking it with the three visions of God Moses has, as it is traditionally understood by the Orthodox Church. He thus talks about the nearness and farness of God. It is really beautiful, and absolutely true. In a sense “knowing” often is our own conceptualisation and so conretisation of something or someone; however it is clear that all things are so multifaceted, multilayered and dynamic that we can only know them by not-knowing them; ie by setting aside all concepts we have of them and keep the whole perceiving apparatus empty of preconceptions, in order to perceive directly the shadow of their inner essence. In Zen it is said: “for the beginner there are many possibilities but for the expert few”. The beginner’s mind is highly praised, exactly because of it being pure/uncoloured (empty in buddhist terminology) perceiving. Met. Kallistos calls this in the book “turning the pyramid on its head” ie keeping the perception open to all possibilities. I don’t, in a blog comment, think I can really answer the question that was directed to me (twice) , especially as there is no single thing I can point to. For what it is worth, the recent spate of books by the “new atheists” forced me to confront the poverty of the arguments for “committed atheism.” That was probably the key trigger that started a long process. For a person that finds, for example, Hitchens’s book anything but jarringly unsatisfactory, I am not sure where to start. Father, thank you for this beautiful post… how true your words are! I grew up very far from Christianity, and spent such a long time wrestling with the various arguments for and against, and a longer when I caught caught up in skepticism and pragmatism in university. It took me quite a long time to learn that all the proofs in the world won’t bring about faith, or even sustain it. I’ve been a pagan and an atheist at various points of my life, and I couldn’t really tell you why I am now a Christian, not in any sort of intellectually compelling way. The best I can come up with, more often than not, is that I fell in love with Love Himself… because it’s been something incomprehensible. Just pure gift. It is this existence of “pure gift” that I feel keeps pointing me towards God. I have my struggles, both personally and intellectually with God and faith, but I can’t help but recognize that all the best things in my life are more gift than anything. There’s a line from a poem I read in college that’s always “haunted” me if you will, that goes “because God’s gifts put man’s best dreams to shame.” (It’s the last line of a sonnet by Elizabeth B. Browning.) I’ve tried replacing “God’s gifts” with “life’s gifts” but it loses it’s weight and depth and simply doesn’t ring true to me anymore. I hope I haven’t digressed too much. Based on an experience I had several years ago, I would say that whether you know it or not, or whether you want it or not or whether you like it or not, you are in God’s presence. Several years ago, I got really mad at God. I confess. And I shouted out, “God, I hate you.” Immediately the air around me turned very cold, and I sensed deep darkness coming over me. After a few seconds of this I humbly pleaded, “God, can I please take that back?” The cold and darkness disappeared. I learned very quickly what life is like without the presence of God. You are right. If I may be so bold to say, at the very heart of Orthodox Christianity, is Jesus’ consubstantiality with God in divinity and with us in humanity. This is the catalyst for transformation that sets us upon a path that is “not yet” but is “already now”. This is what it means to be “fully human”. It is to look into eternity and to be renewed by it, no less. And David S., that’s a great link!! I’d like to point out that, as far as I’ve noticed, no atheist has ever provided either rational argument or physical proof against God’s existence (oh the oxymoron! Ουρανοί διηγούνται δόξαν Θεού, how could it be otherwise?). Even the most popular books of late only count on “arguments” based on the manifestation of evil in the world, which take advantage of a person’s disappointment in his life in order to turn it against God. The tragedy of said person is that most of what he perceives to be caused by God is caused by himself or other humans. Regarding knowledge of God: I believe that knowing God fully is impossible, like the Fathers proclaim. However, what is possible and is the achievement of the true faith is the communion of man with Him and the peace and knowledge that stems from it via the Ευχαριστία. Orthodox Christians fully know and live the experience. That’s how we know who God is. Thank you, Father Stephen. Your blog is like a breath of fresh air in the polluted air of the cities.